Catherine C. Coombs, MD, is a UNC Lineberger Comprehensive Cancer Center member and Assistant Professor of Medicine in the Division of Hematology and Oncology at UNC-Chapel Hill. 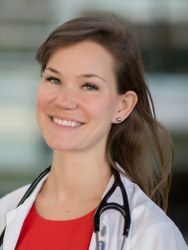 Dr. Coombs sees patients with hematologic malignancies, including chronic lymphocytic leukemia and the closely related disease, small lymphocytic lymphoma, myelodysplastic syndromes, myeloproliferative neoplasms, MDS/MPN overlap syndromes including chronic myelomonocytic leukemia, chronic myeloid leukemia, hairy cell leukemia, large granular lymphocyte leukemia, prolymphocytic leukemia, acute myeloid leukemia. She also an interest in patients with precursor states such as clonal cytopenias of undetermined significance and clonal hematopoiesis. Dr. Coombs’ research interests center on the application of genomic correlates to improve the clinical care of patients with leukemia. Her main area of research focus is on clonal hematopoiesis (CH), which is the idea that individuals without leukemia can carry leukemia-associated mutations in their blood cells. This can have important implications including a risk for development of a subsequent hematologic malignancy (most typically MDS or AML), and can be associated with increased risk of dying from cardiovascular causes. She has performed research examining the impact of CH on patients with solid tumors, and identified associations with prior cytotoxic therapy, and impact on long-term outcomes such as development of subsequent hematologic malignancy and overall survival. Further, Dr. Coombs has demonstrated that these blood-derived mutations can lead to confounding of interpretation of tumor-only sequencing assays, as CH-events may be misinterpreted as tumor-derived events in individuals whose tumor biopsies have a significant amount of admixed leukocytes. Dr. Coombs also has performed research to better understand the genetic risk factors leading to the development of chronic lymphocytic leukemia. Lastly, she has an interest in the application of molecularly-targeted agents to the treatment of patients with hematologic malignancies, through use of these agents in various stages of clinical trial development.